Experts asked: why is male cancer 'disproportionate'? The MHF is teaming up with the National Cancer Equality Initiative to host an expert round-table on men and cancer. Some 50 specialists from a variety of backgrounds will gather at the King's Fund in London on 29th January 2013 for an event co-chaired by MHF chair Professor Alan White of Leeds Metropolitan University and Joanne Rule of the NCEI at which the new report Excess Cancer Burden in Men will be launched. 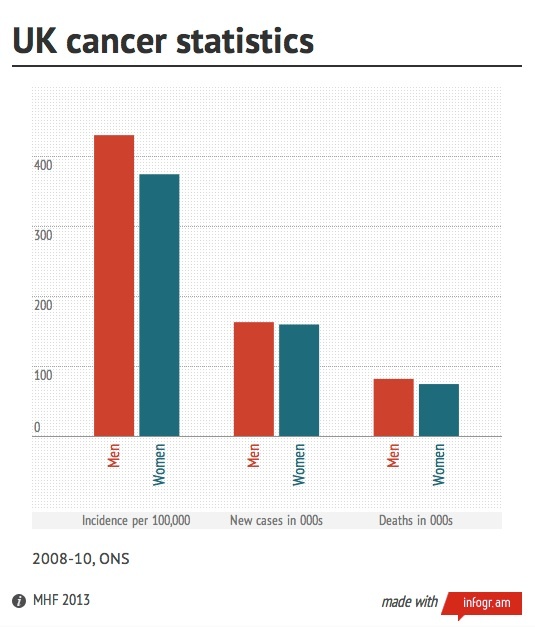 ONS figures published in December 2012 from 2008-10 show that about 163,100 men and 159,800 women were newly diagnosed with cancer in each of those years (an incidence rate of 431 per 100,000 men and 375 per 100,000 women) and that about 81,800 men (mortality rates of 204 per 100,000 men and 149 per 100,000 women).